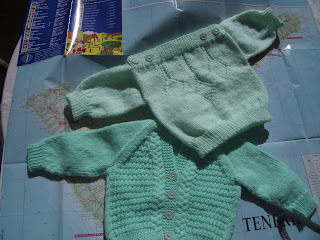 The cardigan is for a friend who's daughter is expecting, and was a little experiment in knitting in the round. 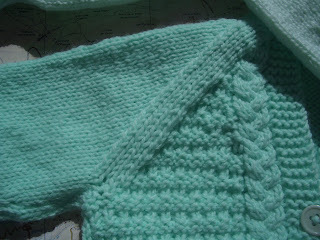 I enjoy a little light knitting, but always procrastinate when it comes to sewing all the parts together. I used a commercial Patons pattern for the stitch count, and started by casting on the the sleeves together on one loop needle using opposite ends of the ball of yarn. I knitted up to just before the armhole cast off as if knitting a pair of socks, making the increases at the beginning and end of the appropriate rounds. I then left these on a couple of holders while I cast on sides and back in one piece, and knitted up to the armhole shaping again. I had to do a little working out for the buttonholes, as the pattern said to knit one front, space out the buttons, then knit buttonholes to match, but that was easy enough. When it came to attaching sleeves to body, I was on a wrong side row because then I wouldn't need to worry about the pattern. I worked across one front, then positioned the sleeve so that the stitches that would normally be cast off lined up with the stitches that would normally be cast of on the body, and purled the two sets together, thus formimg the underarm seam without any need to sew. I continued across the back, attached the second sleeve and purled across the other front. The next few rows were the most difficult. 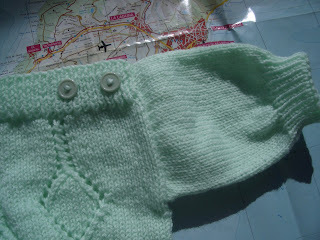 Keeping the pattern correct, I knitted across the first front, then across the sleeve stitches, back stitches and front stitches, placing markers for the raglan seams as I went. I found it easiest to pull the needle loop through in the middle of the sleeves as I had when knitting them. It was a little tight for the first few rows, but as soon as I started the raglan decreases it got easier by the row. I wasn't sure what would happen with the garter stitch button band as I got up towards the neck, but I just knitted the last garter stitch with a shoulder stitch until I reached the top of the shoulders, then knitted it seperately for the last inch and a half. Apart from sewing in the ends and sewing on the buttons, this little bit was the only sewing I had to do. I love them, I am sure they will be really appreciated. 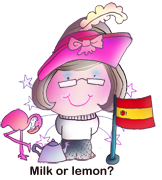 ....darling sweaters Totty! You must be a fast knitter? You seem to accomplish so much - great job!